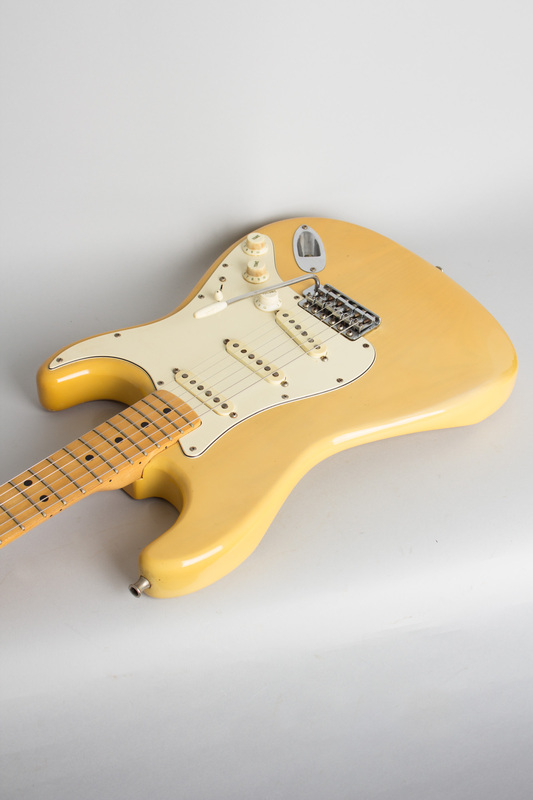 Fender Stratocaster Model Solid Body Electric Guitar (1974), made in Fullerton, California, serial # 566346, blonde finish, ash body, maple neck, period black hard shell case. 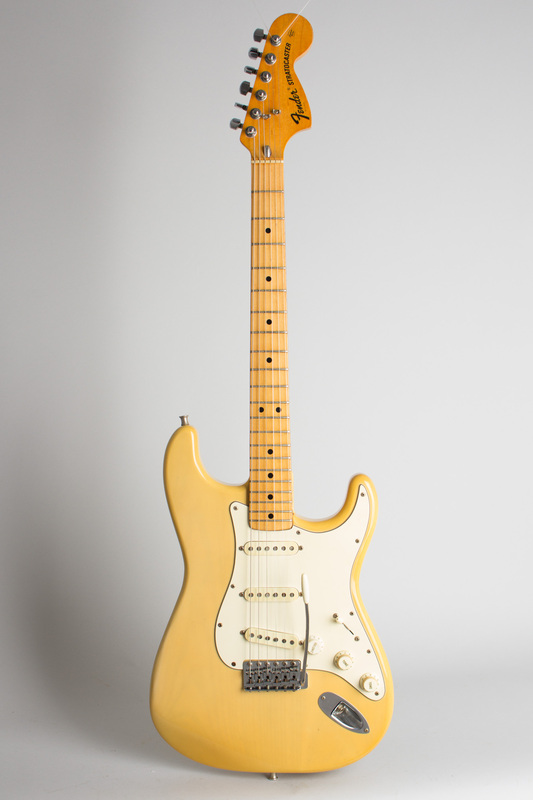 This late 1974 Stratocaster is resplendent in a (by that time) fairly rare blonde-over-ash finish, a long Fender tradition often by then supplanted with a straight natural livery. 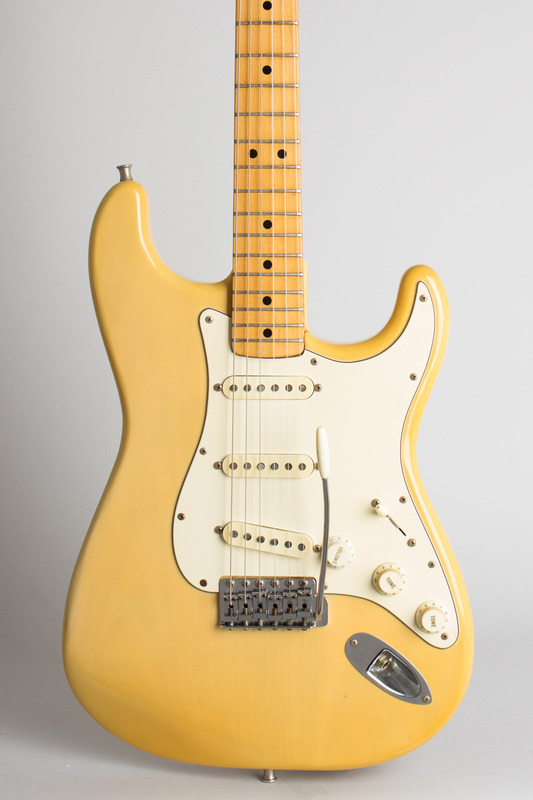 This semi-see-through finish is heavier than the 1960's style but not yet the super-dense "Thick Skin' polyester that enveloped the Strat starting in 1975. 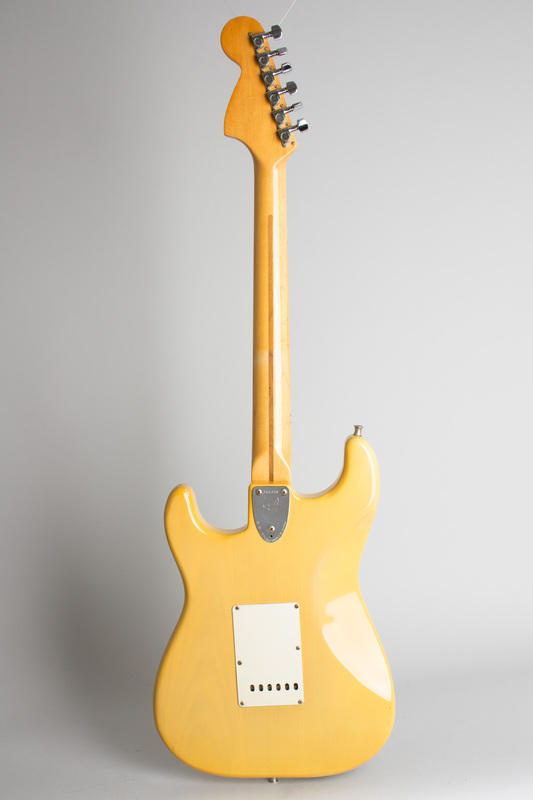 This guitar has other soon-to-disappear features as well, being one of the last with staggered-pole pickups (changed to flat-pole in 1975) and still carrying the white pickguard and trim supplanted by black plastic in 1976. This is a fairly heavy but still good playing and sounding Strat, typical of its '70's era but still having some late '60's character. Overall length is 39 1/4 in. (99.7 cm. ), 12 3/4 in. (32.4 cm.) wide at lower bout, and 1 3/4 in. (4.4 cm.) in depth, measured at side of rim. Scale length is 25 1/2 in. (648 mm.). Width of nut is 1 5/8 in. (41 mm.). This is a very clean '70's Strat with very little wear overall and it remains mostly original-and remember this was the era of massive numbers of Fenders becoming Frankensteins of all sorts. This guitar has only a couple of typical period alterations. 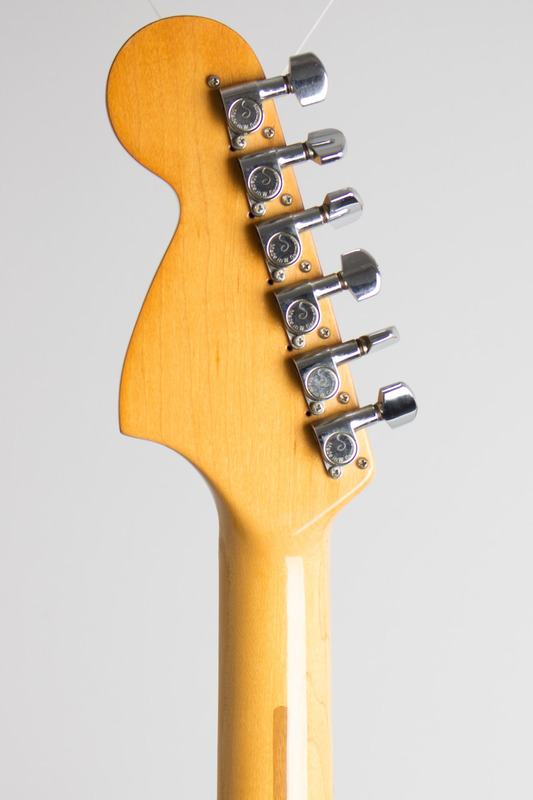 The tuners were changed to Schaller Minis (a neater job than many at the time) with the original screws artfully reinserted into the now-redundant holes. There are Strap-lok buttons added, and a heavy leather strap in the case to go with them. This is quite useful as this ash-body Strat tips the scales at a bit over 10 Lbs., so is a bit of a load to hoist! 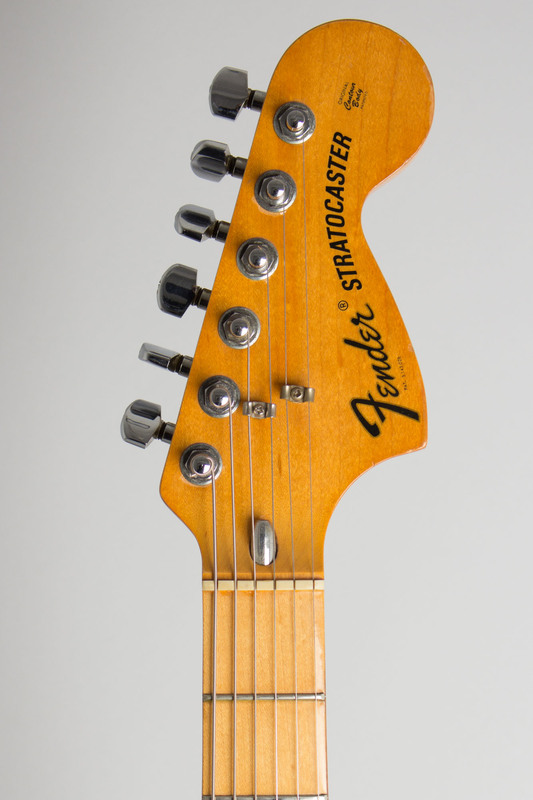 All other hardware is original, including the late staggered pole pickups and wiring rig, with all components dated to 1974. The tone knobs are not an exact color match to the volume but that appears to be just a period quirk we have seen before-they are all from this era. 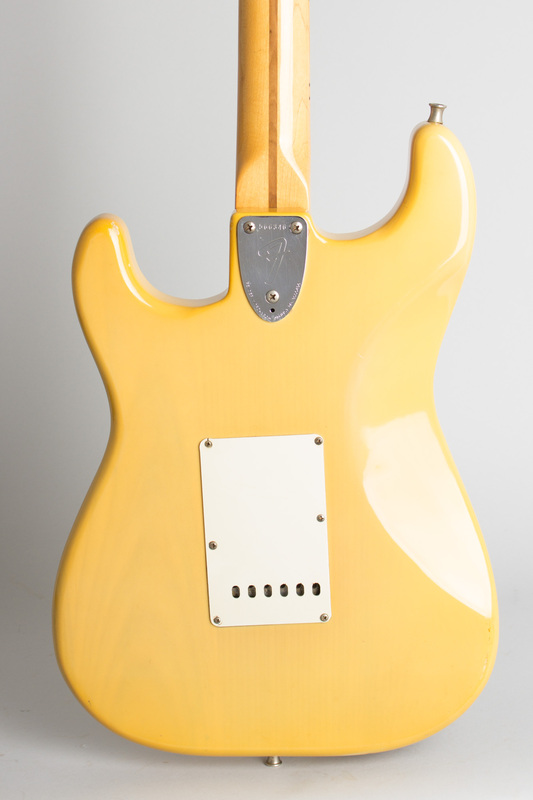 The blonde finish looks great with only some tiny dings and dents and the natural neck finish is similarly clean. This is a very spanky-sounding Stratocaster with a lively tone and some great "in-between" sounds, though you have to balance the original 3-way switch to get them. A great-looking and fine playing CBS Strat, living in a period but non Fender HSC with some vintage stickers on the lid. Excellent - Condition.